Colorful selections of both pumpkin and squash are on display for purchase at this produce stall in the town of Keremeos in the Okanagan-Similkameen Region of British Columbia. This colorful pumpkin and squash display is part of a produce stall in the town of Keremeos, which is a town in the Okanagan-Similkameen Region of the Okanagan in British Columbia, Canada. Keremeos has a reputation for growing and selling some of the best produce in the province. These pumpkin and squash would be grown locally and visitors and locals can purchase them knowing that their produce is fresh and of the highest quality. Many people in Keremeos make their living off the growing and selling of produce, especially in the summer time, although also during other seasons as this display of vegetables demonstrates. This area of the Okanagan is perfect for growing all kinds of vegetables and fruits as it is warm and the soil is perfect and this area is sheltered from the wind. 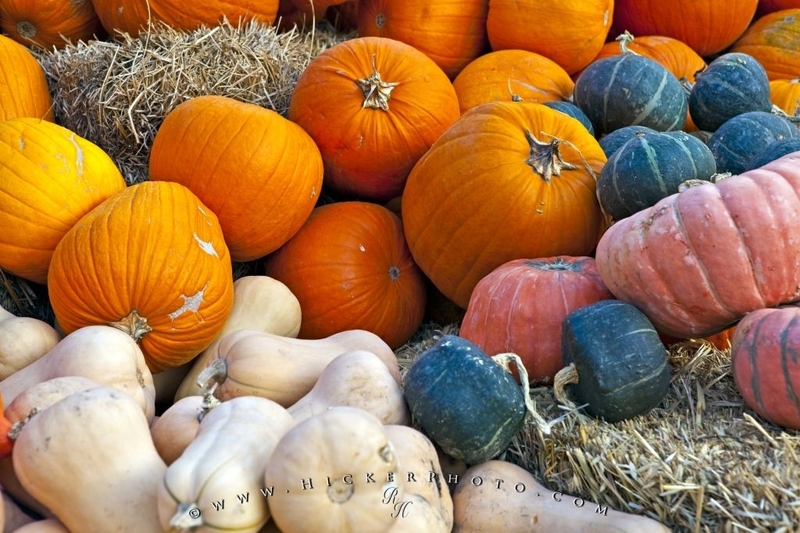 Photo of a colorful pumpkin and squash display in the town of Keremeos, Okanagan-Similkameen Region, BC. ... There are many different things one can do with these vegetables; pumpkins are used at Halloween, but their flesh and seeds can also be eaten. Squash can be cooked as well, and also used for decoration in the Fall as they represent the harvest and the changing seasons. Pumpkins and squashes for sale at a produce stall in the town of Keremeos, Okanagan-Similkameen Region, Okanagan, British Columbia, Canada. I photographed this photo with the digital SLR camera model Canon EOS 5D Mark II, aperture of f/7.1, exposure time of 1/50 sec. on ISO 100, as always I used a original Canon Lens, the focus lenght for this picture was 70mm.